La Vigne French Corkscrew, Chardonnay Handle A premium, handmade French corkscrew. Satin finish stainless steel. Handles are made of actual vine stock with stainless bolsters on each end. Three varietals: Cabernet Sauvignon, Merlot and... The Barman’s Deluxe Cocktail Shaker Set makes a great cocktail mixer if you are a savvy bartender, versed in all the methods of Mixology, or the home bartender entertaining for a cocktail party. This stainless steel cocktail maker has recipes. 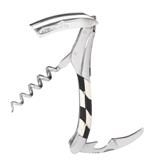 Cabernet Sauvignon Handle La Vigne French Corkscrew – Made in France A premium, handmade French corkscrew. Satin finish stainless steel. Handles are made of actual vine stock with stainless bolsters on each end. Three varietals: Cabernet... The Castello Collection of Two-Step Waiter’s Corkscrews are handcrafted in Italy. All metal parts are of stainless steel. All the Castello Waiter’s Corkscrews are made in the cutlery capital of Italy. The Castello Collection of Two-Step Waiter’s Corkscrews are handcrafted in Italy. All metal parts are of stainless steel. All the Castello Waiter’s Corkscrews are made in the cutlery capital of Italy. The Castello Collection of Two-Step Waiter’s Corkscrews are handcrafted in Italy. All metal parts are of stainless steel. All the Castello Waiter’s Corkscrews are made in the cutlery capital of Italy. The Castello Collection of Two-Step Waiter’s Corkscrews are handcrafted in Italy. All metal parts are of stainless steel. 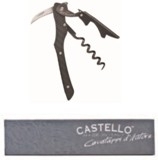 All the Castello Waiter’s Corkscrews are made in the cutlery capital of Italy Real stag horn handle, stainless steel bolsters, micro-serrated blade, cap opener. 4-3/4 inches long. France. Pkg. Code: BX. Imprint area for all Cepage Corkscrews 1/2 inch X 1/4 inch on boot lever. Cepage Laguiole Waiters Corkscrew, Tortoise Shell Imitation tortoise shell handle, gold-plated bolsters, micro-serrated blade, cap opener. 4-3/4 inches long. The Donalello Waiters Corkscrew with fine serrated blade and double lever also has a sapele handle. This precision-made corkscrew requires 160 hand detailing steps to complete. 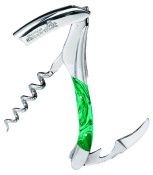 Corkscrew has balanced weight for both smooth and easy extraction. Deluxe stainless steel remover pops off crown caps in seconds. Place on top of the bottle and press and cap pops off easily. Rubber rim at base. 4-1/4" tall, 2" dia. at middle. Pkg. Code: BX. Imprint area: 1" x 1". Metal Laser. Natural Aluminum. The five-turn spiral penetrates any cork easily, the stainless steel filet blade is micro-serrated to insure an excellent cutting edge, and the stainless steel boot lever gives strong, positive extracting action. 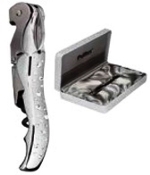 The Laguiole en Aubrac corkscrews signify a true holdover of traditional Laguiole, France fine craftmanship. The Laguiole en Aubrac corkscrews signify a true holdover of traditional Laguiole, France fine craftsmanship. Artfully crafted and assembled by hand, each corkscrew embodies a particular theme invented by the creators. Truly the ultimate keepsake for the wine lover. Introducing Eight Exquisite Models of the Laguiole Millésime Corkscrew, Laguiole en Aubrac Brown Horn (from Italian Buffalo, High Polish Stainless Steel Each corkscrew is assembled entirely by hand and signature marked by the same master craftsman. The Sable is designed for the professional, but is suitable for home use. It is built to endure vigorous, repeated operation. This high quality corkscrew is handmade in Thiers, France, and designed by an award-winning sommeliers. This high quality corkscrew is handmade in Thiers, France, and designed by an award winning sommelier. This Lemon and Lime Squeezer is spring loaded with a heavy-duty scissor squeezer to strain your lemon or lime. 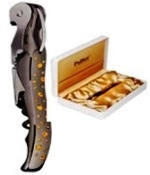 Merlot Handle La Vigne French Corkscrew – Made in France A premium, handmade French corkscrew. Satin finish stainless steel. Handles are made of actual vine stock with stainless bolsters on each end. Three varietals: Cabernet Sauvignon, Merlot... Fresh, new design. Built in hinged wrench above to open screwtop or Champagne bottles. Same unique hinged double lever that has made Pulltap’sR famous. With an extendable handle for compact pocket storage Pulltap’s Toledo Corkscrew - Made in Spain Pulltap’s Toledo Corkscrew - Made in Spain Unique hinged double-lever system. Hardwood inlaid handle. igh-polished nickel plate, curved blade. TeflonR spiral. 4-3/4” long. Pkg. Code: BX Imprint area on metal side: .” X 3/16”. Laser. Finely crafted by a quality Italian knife manufacturer. Completely cut by laser. 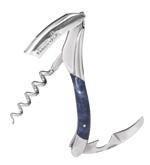 Its unusual ergonomic handle gives the user a good grip while extracting corks.